I visited the bee-friendly South Austin site today to find the best spot for the hive. Bees are pretty adaptable when it comes to location, but ideally you want to find a spot where the hive entrance gets early morning sun to warm the hive, but have some protection in the afternoon especially when the Texas summer is in full swing. However, I know of some beekeepers who keep their hives on their roofs even in Texas so they can handle the heat. We found a great location near the edge of the property line so as not to disrupt the use of the rest of the backyard near an established live oak. The oak will provide shade in the afternoon, but the location will hopefully get the early morning sun. Although not required for your site, my hive will have the benefit of two chicken neighbors (named Chicken and Ostrich) who will offer their encouragement and support in South Austin solidarity. The next step is clearing the brush and vegetation, leveling the area and building a small 3′ x 3′ pad of decomposed granite for the hive to rest on. Austin’s winter this year has been pretty cold which has made working outdoors difficult. As of right now, next weekend is supposed to be sunny and in the upper 60’s, and I’m looking forward to a break in the freezing temperatures we’ve had so far. I just attended a webinar on Urban Beekeeping put on by Brushy Mountain Bee Farm. Three beekeepers from around the United States gave their own opinions and advice on keeping bees in urban areas; Cindy Bee, a beekeeper in the Atlanta, GA area, Toni Burnham in Washington, DC, and Cameo Wood in San Francisco. It was pretty informative although I think it was geared more towards people who are still debating about starting a hive. The webinar will be uploaded in the next 24 hours to Brushy Moutains’s website under their video resources section. City Code. For any Austin residents, the code is located here. Me: I’m thinking about starting a bee hive in my backyard and wanted to discuss it with you. Neighbors: How many bees are we talking about? Me: Um, like 100,000 or so…. So that basically sealed the deal of finding an alternative location. Technically my neighborhood convenant also states I can’t keep livestock or animals beyond the usual cats, dogs, and other normal pets. 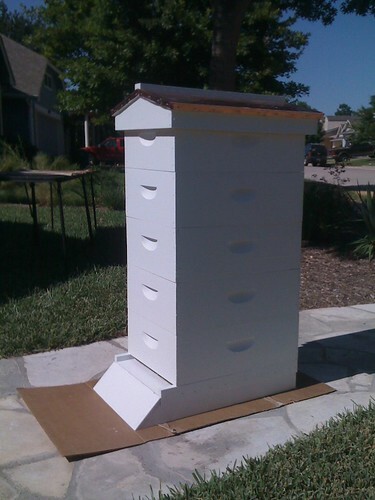 Lucky for me, south Austin in generally more laid back about bees (and chickens, pigs, etc), so I was able to find a friend willing to let me place a hive in their yard. There is an initial investment in equipment before you can start keeping bees. I spent less than $500 on all my equipment and hive, but like any hobby or sport, the amount you spend can vary. To use a golf analogy, could you spend thousands of dollars on clubs and all the latest equipment before learning to play? Sure you could. Could you also find a set of clubs at a garage sale and spend less than 100 bucks? You could certainly do that as well. I bought the bare minimum to get started which included a hive plus frames, bee suit and veil, gloves, hive tool, smoker, and feeder. I decided to standardize on an 8 frame hive from Brushy Mountain Bee Farm using medium supers. You could easily decide to go with a 10-frame hive or top bar hive, but it really depends on what your end goals are for your hive. I got my bee suit, veil, and gloves from Dadant and Sons mainly because I liked their suit styles better. Once you have your equipment, all you need is a place to place your hive and wait for your bees to arrive. Beekeeping is not an endeavor that should be taken lightly and one should make sure they are committed to the time and effort required to maintain a healthy hive. Once you have made that decision, how does one go about becoming a beekeeper? The first thing I did was try and learn everything I could about bees and beekeeping. There are quite a few good books on the subject, and I recommend either buying or borrowing several to get exposed to variety of techniques and philosophies. I found The Backyard Beekeeper by Kim Flottum and Beekeeping for Dummies by Howland Blackiston to be excellent resources. However, the best way to learn is by doing, and if you are lucky to live in an area that offers beekeeping classes, it is truly an invaluable experience. Not only does it give you hands on experience, but you will quickly figure out if opening a hive filled with tens of thousands of bees is something you really want to be doing in your spare time. If you live in the Austin area, there is an excellent class at Round Rock Honey given by Konrad Bouffard. It was this class that really gave me the confidence that this was something I could do and do well. I’ve always been fascinated with bees and have been wanting to start a hive for about 7 years now. When I was laid off back in the dot com bust days, I figured that would be great time to get started, but making the leap from wanting bees to actually getting bees was a little overwhelming. Back in 2003, I tried finding local resources to kick start the process, but either did not have luck or they were hopelessly outdated. Flash forward to 2009 and the landscape has changed considerably. The media frenzy around Colony Collapse Disorder along with the local and organic food movements has made it much easier to get started in beekeeping.